Originally called “Armistice Day,” the holiday began in 1918, celebrating the end of World War I and the idea of ending all war. 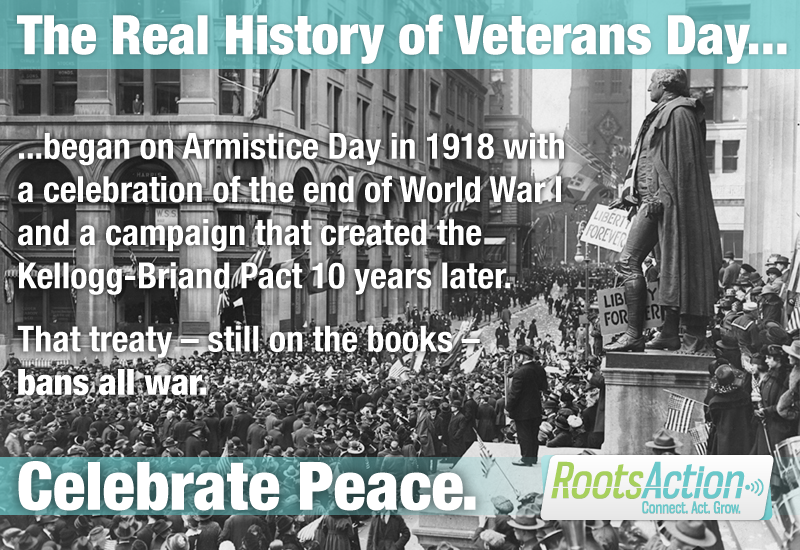 A 10-year campaign launched that year resulted in the ratification of the the Kellogg-Briand Pact which legally banned all war making. "The High Contracting Parties solemly declare in the names of their respective peoples that they condemn recourse to war for the solution of international controversies, and renounce it, as an instrument of national policy in their relations with one another. "The High Contracting Parties agree that the settlement or solution of all disputes or conflicts of whatever nature or of whatever origin they may be, which may arise among them, shall never be sought except by pacific means." As your constituent, I'm writing to remind you that war making is illegal. The United States is party, with much of the world, to a treaty banning all war. The Kellogg-Briand Pact states: "The High Contracting Parties solemly declare in the names of their respective peoples that they condemn recourse to war for the solution of international controversies, and renounce it, as an instrument of national policy in their relations with one another. "The High Contracting Parties agree that the settlement or solution of all disputes or conflicts of whatever nature or of whatever origin they may be, which may arise among them, shall never be sought except by pacific means." Please bear this in mind going forward.